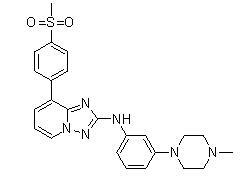 Remarks:CEP-33779 is a highly selective, orally active, small-molecule inhibitor of JAK2. CEP-33779 induced regression of established colorectal tumors, reduced angiogenesis, and reduced proliferation of tumor cells. Tumor regression correlated with inhibition of STAT3 and NF-κB (RelA/p65) activation in a CEP-33779 dose-dependent manner. The ability of CEP-33779 to suppress growth of colorectal tumors by inhibiting the IL-6/JAK2/STAT3 signaling suggests a potential therapeutic utility of JAK2 inhibitors in multiple tumors types, particularly those with a strong inflammatory component.